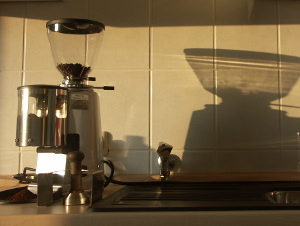 Some time in 2006, back then still an unmarried software developer with quite some time and money to spend on various hobbies, I asked myself if that bitter brown stuff in my coffee mug was really the climax of what is possible. I looked around and read comparisons on fully automated coffee machines, when my former girlfriend stumbled over the site Kaffee-Netz, a German forum of coffee enthusiasts. I submerged for a few hours (ok, days) and gathered a lot of information on espresso machines and the true art of making coffee and when I resurfaced, I had a plan. 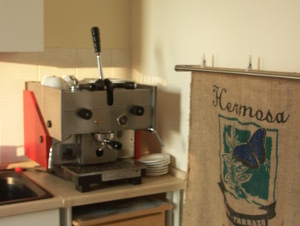 The first thing I did was to buy a coffee grinder, since all forum members seemed to agree that the Mazzer Mini does a great job at a reasonable price (if just short of 400 Euro is what you call reasonable of course). 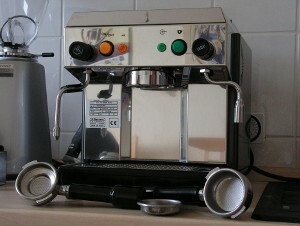 After distilling some more information, I decided to buy a Bezzera BZ99, which is probably not the nicest of all machines, but capable of making a good espresso. Well, it was - at least after applying a serious amount of tuning, which at one point included exchanging the spring of a valve against one taken from a cheap soap dispenser that I bought and disassembled for that purpose. When I had gathered enough experience with the BZ99, I put it aside and bought my first lever machine, an Astoria from the early 1980's. The contrast couldn't have been bigger. 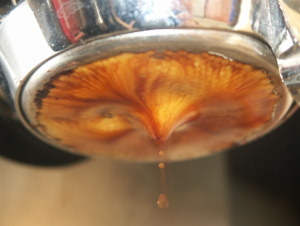 Instead of an always too small water tank and drip tray it was directly connected to the water pipe and the drain, it made very good coffee from the first attempt on and it had one feature I still value each and every morning: it was silent. Not long after I enjoyed coffee from the Astoria each morning, I naturally wanted to have that coffee all day, so I got another Mazzer Mini grinder and another lever machine, this time a La Cimbali M20, for the office and sold the BZ99. 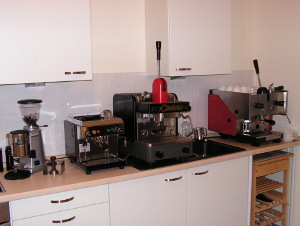 A few years later when I left the company I sold the Cimbali and all the equipment with it to a colleague however, because my new job did not allow me to keep the machine. Apart from some broken valves and gaskets, the Astoria lever machine still works like a charm after all these years and makes a perfect cappuccino for me and my wife each morning.